John has over 5 years of investment experience. He focuses on research and analysis in investment-grade and high-yield corporate credits. He obtained his undergraduate degree from St. Norbert College and is currently pursuing his MBA at Marquette University. 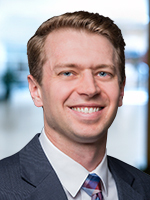 John received the Chartered Financial Analyst designation in 2014 and is currently a member of the CFA Institute and is a member of the CFA Society of Milwaukee. Prior to joining Baird Advisors, John was an Investment Analyst at Northwestern Mutual Real Estate where he was responsible for tenant credit research and mortgage loan relative value analysis. He began his career as an internal auditor at BMO Harris.